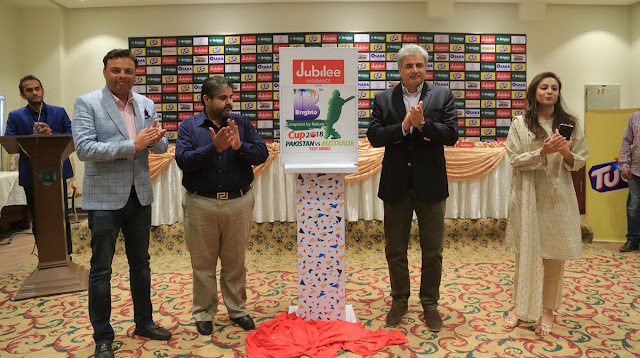 Jubilee Insurance unveiled as the presenting sponsor of the upcoming Pakistan vs Australia Test Cricket Series in UAE at a press conference by Pakistan Cricket Board in Lahore. Picture shows (L-R): Syed Usman Qaiser, Chief Manager Marketing Jubilee Life Insurance, Khawaja Atif Sikka, Director Sales and Marketing Brighto Paints, Zakir Khan, Director International Cricket Pakistan Cricket Board and Sana Tariq, Senior Brand Manager Continental Biscuits Limited. Karachi: October 4, 2018 -Jubilee Life Insurance, Pakistan’s largest life insurance provider in the private sector is the proud presenting sponsor of the Pakistan vs. Australia cricket test series to be held in UAE. The announcement was made at a press conference in Lahore, Pakistan. The audiences world over will witness two cricketing titans coming head on in this exciting tour which includes two Tests and three Twenty20 Internationals with the first Test beginning on Sunday October 07 at the Dubai International Cricket Stadium in Dubai. “Jubilee Life Insurance has always taken a lead and been one of the top supporters as far as facilitating sports in Pakistan is concerned. We feel proud in playing a key role in bringing cricket back to our nation starting with the PSL 3, followed by the Pakistan vs. WIndies series that took place earlier this year. With the same enthusiasm, Jubilee Life Insurance has continued to lend its support to this current tour and brings cricket for its fans and passionate spectators of the country.” said Syed Usman Qaiser, Chief Manager Marketing, Jubilee Life Insurance. “Once again we are honored to see Jubilee Life’s commitment towards cricket in Pakistan. Over a period of time, this company has become one of the pillars upon which cricket has constantly grown in this nation. We envision being on the right path to reviving cricket in the country and the support of organizations like Jubilee Life Insurance will definitely help us achieve our objectives. We now hope the Pakistan team has a successful tour and is victorious.” said Zakir Khan, Director International Cricket, Pakistan Cricket Board. Jubilee Life Insurance has become synonymous with sports in the country and upholds the brand essence being ‘Live Free’. The company was the gold sponsor of the PSL 3. Jubilee Life Insurance was also the lead sponsor of the Pakistan Super League (PSL) outfit Quetta Gladiators last season, as well as, being the gold sponsor of Pakistan vs. Sri Lanka cricket series. Other than cricket, Jubilee Life has also supported other sporting events in Pakistan including snooker, polo, hockey and golf.